*Use a high quality avocado oil or unrefined coconut oil…just a little goes a long way! *Use LOTS of your favorite vegetables, 4-6 of your favorites. Buy what is in sale, or in season. *Chop vegetables as uniformly as possible for best results. *Always quickly cook your meat (if using) first, then set-aside while cooking veggies. *Serve over quinoa or brown rice, OR do what I did, and pack the veggies so thick that no grain is required. Prepare your sauce by whisking the aminos, lime juice, honey and red pepper flakes. Set aside. Heat one tsp of the oil in a non-toxic wok or large skillet over medium- high heat. Once wok is hot, add the chicken, and cook until golden, just a few minutes. Remove chicken or shrimp from the wok and set aside. 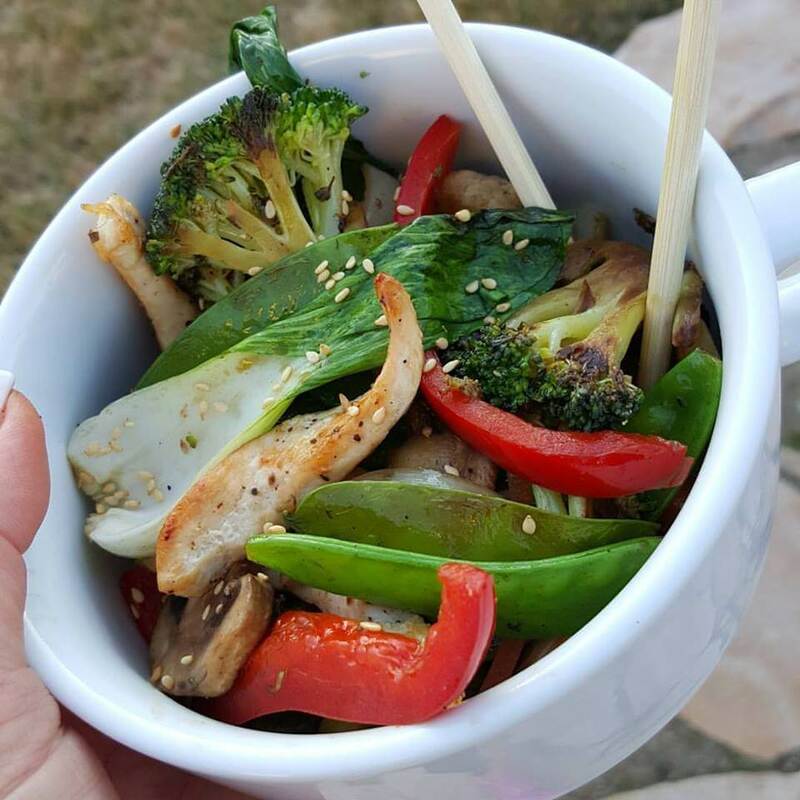 Add 2 tsp of the oil to the wok and heat over medium-high; as soon the oil is hot add the broccoli, onions and bell pepper and stir-fry, for 1 minute. Add the remaining oil and then add the carrots, mushrooms, and bok choy; stir-fry for a minute. Add in the snow peas and continue stir-frying until all vegetables are tender-crisp. Clear the center of your wok and add garlic and ginger; mash garlic and ginger onto the hot surface with the back of a spatula. Allow to cook for 30-seconds. Remove the wok from the heat and stir garlic and ginger mixture in with the vegetables. 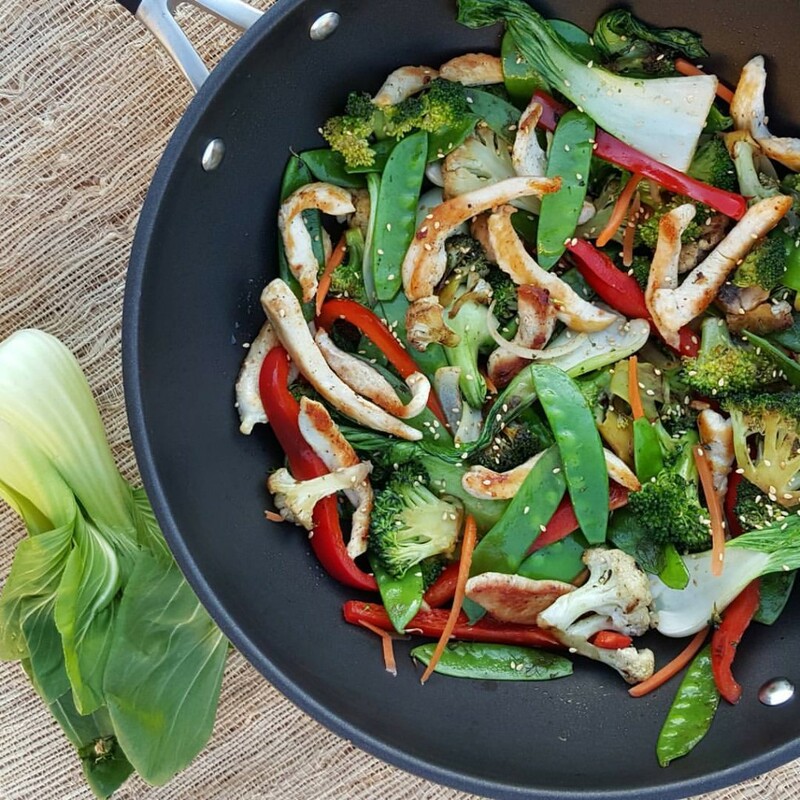 Return wok to the heat and add in the cooked chicken and sauce you made above; stir-fry for just a minute until hot.